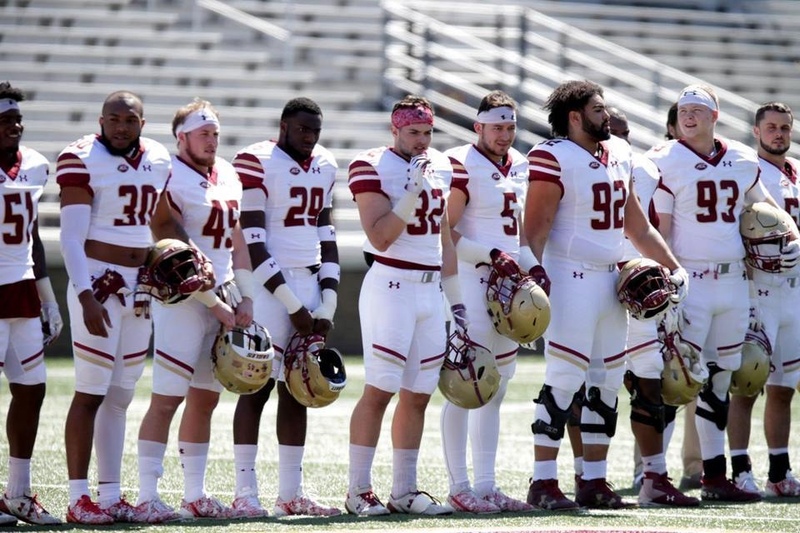 Boston College held their annual Jay McGillis Spring Football game on Saturday in Chestnut Hill. The game was the culmination of 15 spring practices. The game is usually the last two weeks of April but due to Easter being later this year, the Eagles started spring practices early and played the game earlier. 1. Young quarterbacks play the most: Anthony Brown played four series. He looked good in the pocket showing patience and the ability to hang, hitch and deliver. He looked lean and more comfortable as a passer. Getting Brown some reps was important but Addazio and his staff also wanted to get the other quarterbacks some reps as well. Matt McDonald, Matt Velecce, E.J Perry, Sam Johnson and Dennis Grosel got the majority of the snaps. Velecce, a redshirt freshmen from New York was the most impressive of the young quarterbacks. He showed good poise in the pocket and ran the ball effectively on read plays. Velecce also showed good accuracy and touch in the underneath and intermediate passing game. He has improved and he could compete for the back up job in fall camp. 2. No A.J Dillon: Dillon sat out today’s spring game. Given that he had some injury last season, it was smart to sit him out. Dillon not playing enabled the coaches to evaluate the other running backs on the roster. 3. Javion Dayne and David Bailey Impress: Both Javian Dayne and David Bailey were impressive. Dayne ran hard and with good balance and power. He reminds me a lot of his father, Heisman Trophy winner Ron Dayne in terms of his build and running style. Dayne also caught the ball well in the passing game. He will see an enhanced role this season. Bailey also ran hard and with good balance. He broke several tackles and showed the ability to make defenders miss in space. Bailey was also featured in the screen game as well and looked natural catching the football. The Eagles are deeper at running back heading into this season and that depth will pay dividends. If nothing else, it will allow the coaching staff to lessen the workload of A.J Dillon and keep him more fresh in practice and in games. 4. Defense keeps it basic: The defense kept it simple under new defensive coordinator Bill Sheridan. The Eagles lined up in their 4-3 defense and played mostly base personnel. They did rotate their defensive lineman but they didn’t really use their sub packages. Defensive tackle T.J Rayam and defensive ends Joey Luchetti and Isaiah Henderson, a true freshman all played well. The linebackers were also impressive. They will be the strength of the defense led by Redshirt Senior Davon Jones. 5. Tempo O emphasized: New offensive coordinator Mike Bajakian is a spread no huddle coach and will run an uptempo offense in the fall. The Eagles went no huddle for most of the scrimmage yesterday. While at times the offense struggled, the tempo seemed to be effective. Bajakian is a firm believer in using multiple tight ends, a staple of Steve Addazio’s philosophy. The Eagles will be in 11 and 12 personnel a lot and as a result, they will be able to create mismatches with their tight ends and their tempo. The focus will not shift to recruiting and summer workouts for the coaches and players.